Expulsion Through the Dominicans in 1426. Chief city of Rhenish Prussia. There are indications that a Jewish community existed here long before Christianity had become dominant. 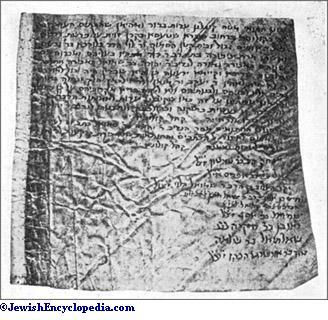 The first official document, however, concerning the Jews of Cologne dates from the time of Constantine, who issued a decree (Dec. 11, 321) abolishing their privilege of exemption from onerous municipal offices ("Codex Theodosianus," iii. 16, 8). His successors, especially Theodosius II., did not content themselves with the withdrawal of old privileges, but curtailed the civic rights of the Jews. 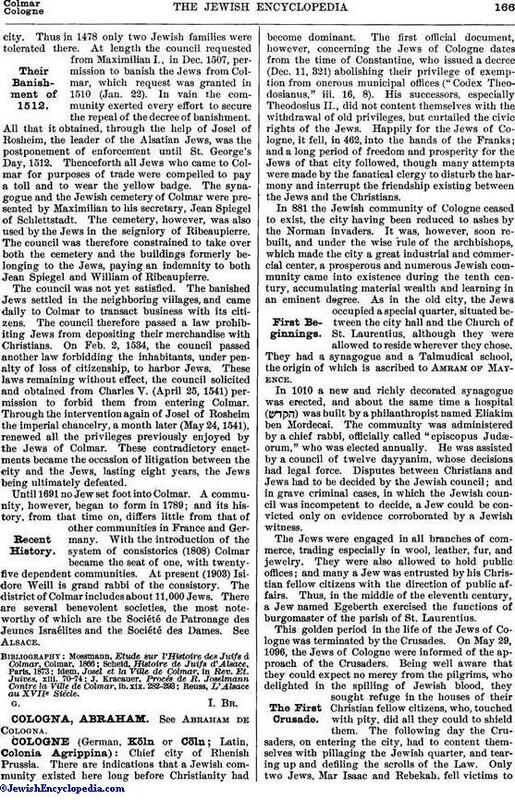 Happily for the Jews of Cologne, it fell, in 462, into the hands of the Franks; and a long period of freedom and prosperity for the Jews of that city followed, though many attempts were made by the fanatical clergy to disturb the harmony and interrupt the friendship existing between the Jews and the Christians. In 881 the Jewish community of Cologne ceased to exist, the city having been reduced to ashes by the Norman invaders. It was, however, soon rebuilt, and under the wise rule of the archbishops, which made the city a great industrial and commercial center, a prosperous and numerous Jewish community came into existence during the tenth century, accumulating material wealth and learning in an eminent degree. As in the old city, the Jews occupied a special quarter, situated between the city hall and the Church of St. Laurentius, although they were allowed to reside wherever they chose. They had a synagogue and a Talmudical school, the origin of which is ascribed to Amram of Mayence. In 1010 a new and richly decorated synagogue was erected, and about the same time a hospital ( ) was built by a philanthropist named Eliakim ben Mordecai. The community was administered by a chief rabbi, officially called "episcopus Judæorum," who was elected annually. He was assisted by a council of twelve dayyanim, whose decisions had legal force. Disputes between Christians and Jews had to be decided by the Jewish council; and in grave criminal cases, in which the Jewish council was incompetent to decide, a Jew could be convicted only on evidence corroborated by a Jewish witness. The Jews were engaged in all branches of commerce, trading especially in wool, leather, fur, and jewelry. They were also allowed to hold public offices; and many a Jew was entrusted by his Christian fellow citizens with the direction of public affairs. Thus, in the middle of the eleventh century, a Jew named Egeberth exercised the functions of burgomaster of the parish of St. Laurentius. This golden period in the life of the Jews of Cologne was terminated by the Crusades. On May 29, 1096, the Jews of Cologne were informed of the approach of the Crusaders. Being well aware that they could expect no mercy from the pilgrims, who delighted in the spilling of Jewish blood, they sought refuge in the houses of their Christian fellow citizens, who, touched with pity, did all they could to shield them. The following day the Crusaders, on entering the city, had to content themselves with pillaging the Jewish quarter, and tearing up and defiling the scrolls of the Law. Only two Jews, Mar Isaac and Rebekah, fell victims totheir rage. Both had refused to escape, and willingly accepted martyrdom. Mar Isaac was dragged to a church, and, spitting on the crucifix held up before him, was there killed. Meanwhile the situation of the refugees became untenable, and detection was feared at every moment. The archbishop, Hermann III., who himself sheltered many Jews in his palace, decided to send them secretly away, to be housed in the neighboring towns and villages of his diocese. For three weeks the unfortunate Jews remained safely in their new hiding-places, but were finally discovered, and shared the fate of their brethren in other towns. Many ended their lives in lakes and bogs, following the example of a pious man named Samuel ben Yehiel. Standing in the water, and pronouncing a blessing, he killed his son; and his assembled coreligionists, while intoning the "Shema'" ("Hear, O Israel!") threw themselves into the Rhine. Various "Memorbücher" preserve the names of a great number of these martyrs, among whom were several proselytes; and a prayer of commemoration is recited every year at Cologne on the Sabbath preceding Pentecost. As soon as the horrors of the Crusade had ceased the community was reestablished by the remaining old settlers who had escaped massacre, and it was augmented by newcomers, who anticipated greater security at Cologne, as the Christian citizens of the city had shown themselves compassionate toward the Jews. Scarcely had fifty years passed in relative tranquillity when a new calamity overtook the community. The monk Rudolph arrived at Cologne (Aug. 1, 1146); and his anti-Jewish speeches soon bore fruit. Meanwhile pilgrims for the Second Crusade commenced to gather; and a renewal of the scenes of 1096 was to be apprehended. In their distress the Jews addressed themselves to Archbishop Arnold, who gave them the castle of Valkenburg and permission to defend themselves with arms. As long as they remained in this place of refuge they were safe; but as soon as they ventured forth the pilgrims, who lay in ambush, dragged them away to be baptized, torturing and killing those that resisted. In commemoration of their sufferings during the Second Crusade, the community of Cologne made the twenty-third of Nisan a fast-day. After the departure of Rudolph the Jews of Cologne reoccupied their dwellings, and those who had under compulsion nominally embraced Christianity resumed their status and places as Jews. But other disastrous effects of the Crusades soon followed. Besides the great loss of life sustained by many communities, the traffic between Europe and the East, hitherto almost wholly controlled by Jewish merchants, passed rapidly into the hands of Christian competitors, and Jews were soon forbidden to engage in any commercial pursuit. Nor were they able to practise handicrafts, owing to the development of the gilds, which excluded Jews from membership. The only means of livelihood left to them, that of money-lending, entailed the ill will of the inhabitants. Thus the characteristic features of the history of the Jews of Cologne from the Second Crusade to their banishment were, as everywhere else, perpetual renewals of privileges—dearly paid for and almost immediately revoked—and periodical outbursts of persecution on the part of the populace. Under Archbishop Reinald (1157-67) the Jews of Cologne were regarded as "servi cameræ," under the protection of the emperor; and the so-called protection, as it was elsewhere, was here an excuse for extortion. At the beginning of the twelfth century the archbishops of Cologne acquired temporal power over the diocese; and the protection of the Jews—in other words, the levying of taxes—was transferred by the emperor to the prelates. The Jews had now to pay, on the Feast of St. Martin, 10 marks and 6 pounds of pepper. But the archbishops understood how to extract additional taxes. Thus, the false accusation that a rich Jewish merchant and a rabbi, called Abrahams, had tendered to a saleswoman base coin in payment for their purchases, compelled the community, in order to save their lives, to pay to Archbishop Philip von Heinsberg 180 marks. Philip, however, carried extortion so far that he was subsequently called to account by the emperor Frederick Barbarossa. An exception to the general conduct of the arch-bishops of the thirteenth century was that of Engelbert von Berg (1216-22). As provost of the Dom he had shown his kindly feeling toward the Jews by presenting them in 1212 with five acres of land for the enlargement of their cemetery. Under his rule the Jews were really protected, and this without the payment of special taxes. A noble who had robbed and killed a Jew was condemned to death by Engelbert. During the struggles between the municipality of Cologne and Archbishop Conrad von Hochstaden (1232-61), the Jews distinguished themselves by their courage in defending the city against the archiepiscopal troops. The municipality showed its gratitude by including them in the treaty of peace of March, 1252. A month later (April 27) Conrad granted the Jews a special privilege for two years. Meanwhile the state of the Jews in Germany generally grew worse from year to year; and the community of Cologne was largely increased by refugees from neighboring towns. The consequence was renewed trouble and violence. Thus in 1266 (June 15), on a charge of having furnished arms to the invading Mongols and Tatars, the community had to mourn twelve additional martyrs, including Rabbi Isaac ben Simson. Whenever possible, the archbishops, for whom the Jews were an inexhaustible source of revenue, quelled the popular out-breaks, and the Jews were safer at Cologne than elsewhere in Germany. In the same year a new privilege was granted, modeled on that of 1252, but with several additional clauses, and with the following stipulations: that no execution should take place in or near the Jews' cemetery; that a foreign Jew might be buried therein; that Jews, whencesoever they might come, should not pay, in the territory of the archbishop, higher taxes than Christians; the archbishop should not tolerate in the city of Cologne any Cauwercini or Christian usurers.These clauses were engraved on stone tablets in the wall of the treasury of the Dom. Archbishop Wicbold (1297-1304) renewed the privilege in 1302 for the sum of 1,200 marks and a yearly payment of 60 marks, in addition to an existing payment of 1,600 shillings to the municipality. In 1349 the sweeping accusation that the Jews had caused the Black Death by poisoning the wells and the rivers, stirred the ever-ready populace to violence. The municipality, be it said to its honor, did all in its power to prevent the impending catastrophe, assuring the inhabitants that the plague was a punishment from God. It even encouraged the municipality of Strasburg, in a letter addressed to the burgomaster of that city, to stand by the Jews. But all these exhortations were of no avail: the executioners would not let slip their prey. Seeing that escape was hopeless, the elders of the community, in a council held on the eve of St. Bartholomew's Day, decided that, in case of an attack, instead of being dragged to church for compulsory baptism, they would set fire to their houses and die with their wives and children in the flames. They had not long to wait. On St. Bartholomew's Day (Aug. 24, 1349) the Jewish quarter was attacked; fire broke out simultaneously in different parts of it, and the whole community perished. It remained only for the authorities to dispose of the spoils; an agreement was made, in 1350, between the archbishop and the municipality by which the former secured the possessions of the victims. For more than twenty years there were no Jews in Cologne. The first new settlers were one Schaaf and his son-in-law, who had to pay 1,000 gulden for admission to the city. It was agreed that each family admitted should pay 100 gulden for protection. Fourteen families settled in the year 1372, paying together 2,000 gulden for admission and 1,150 gulden annually for protection. In 1372 Archbishop Frederick III., in return for a yearly payment of 70 marks, granted privileges similar to those of his predecessors. The old cemetery near Severinsgate was restored to the community; and on St. Thomas' Day, in the following year, the municipality issued a letter of protection, in which it acknowledged the benefits derived from the Jews. About this time the Jews began to acquire houses in the Judengasse, Botengasse, and Burgerstrasse. A part of their old synagogue was restored to them; and in 1372 they acquired the remainder. But this relatively happy state of affairs did not last. The increasing influence of the Dominicans, who had established their headquarters at Cologne—a center of the Hussite movement—showed itself in the enactment, in 1404, of laws prescribing special garments for Jews. On the other hand, the municipality, weary of the struggle against the archbishops, who illegally arrested Jews whenever they needed money, eagerly embraced the opportunity to remove the cause of the discord, and therefore refused, in 1426, to renew the Jewish privileges. The Jews had to leave the city, and thenceforth were not allowed even to pass a night in Cologne. Their synagogue was converted into a chapel, which still exists under the name of Rathauscapelle. Though Cologne had ceased to be a home for Jews, it remained during the fifteenth and sixteenth centuries the center of an anti-Jewish movement. Thence arose the crusades against Jewish books; and baptized Jews like Victor of Carben and John Pfefferkorn found it a fertile field for their anti-Jewish propaganda. 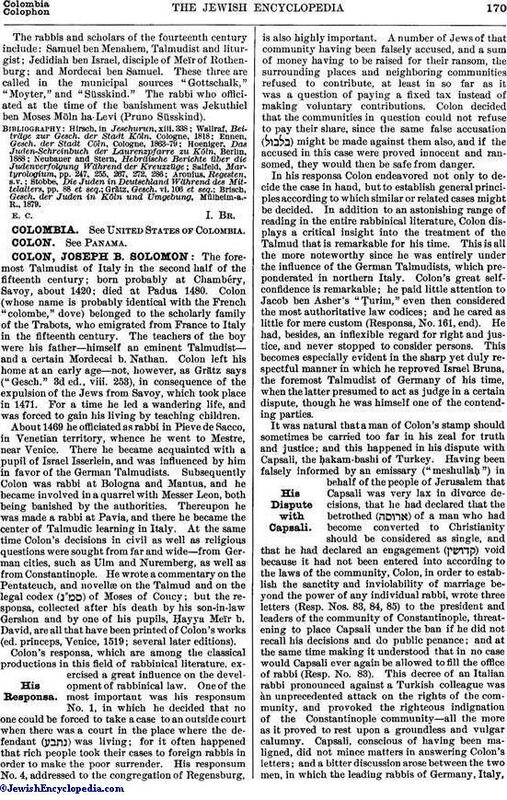 Reuchlin encountered there his bitterest enemies, the Dominicans, who converted the inhabitants of the once liberal city into a bigoted mob. Even after the Protestant reform movement had triumphed, Cologne remained the citadel of the reactionary spirit. Jews of neighboring towns had the greatest difficulty in obtaining permission to stay in the city even for twenty-four hours. Not until 1798, when Cologne became a part of the French republic, were its gates opened to Jews. 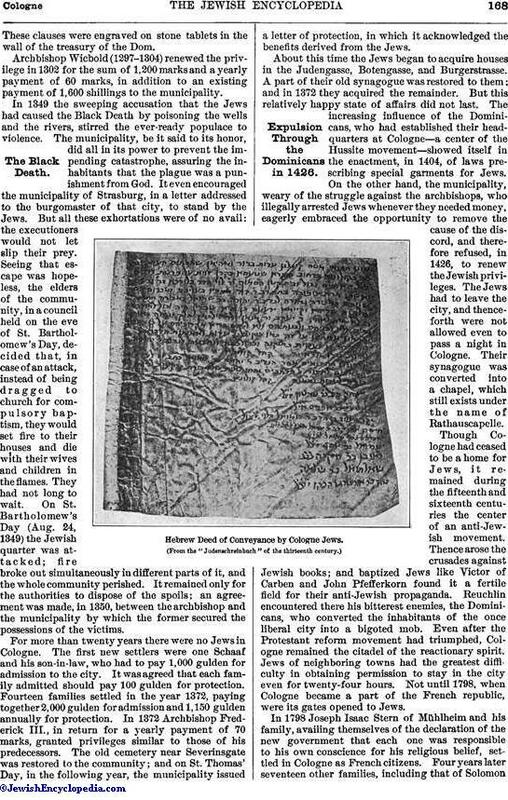 Hebrew Deed of Conveyance by Cologne Jews. (From the "Judenschreinbuch" of the thirteenth century.)Readmission. In 1798 Joseph Isaac Stern of Mühlheim and his family, availing themselves of the declaration of the new government that each one was responsible to his own conscience for his religious belief, settled in Cologne as French citizens. 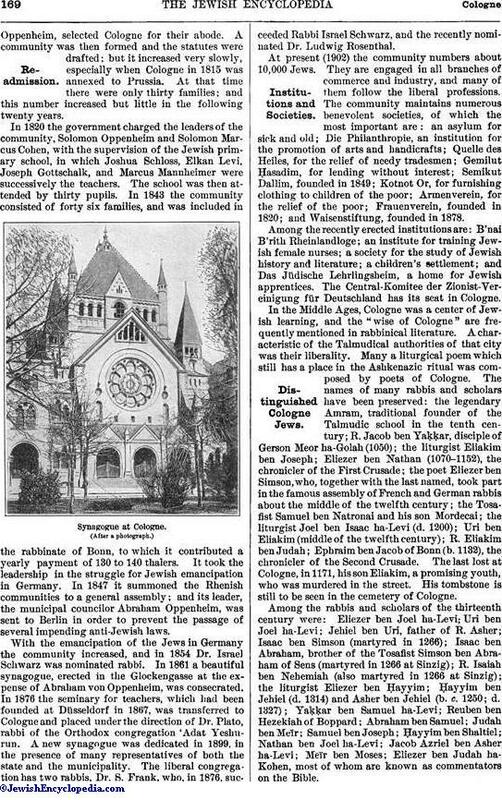 Four years later seventeen other families, including that of SolomonOppenheim, selected Cologne for their abode. A community was then formed and the statutes were drafted; but it increased very slowly, especially when Cologne in 1815 was annexed to Prussia. At that time there were only thirty families; and this number increased but little in the following twenty years. In 1820 the government charged the leaders of the community, Solomon Oppenheim and Solomon Marcus Cohen, with the supervision of the Jewish primary school, in which Joshua Schloss, Elkan Levi, Joseph Gottschalk, and Marcus Mannheimer were successively the teachers. The school was then attended by thirty pupils. In 1843 the community consisted of forty-six families, and was included in the rabbinate of Bonn, to which it contributed a yearly payment of 130 to 140 thalers. It took the leadership in the struggle for Jewish emancipation in Germany. In 1847 it summoned the Rhenish communities to a general assembly; and its leader, the municipal councilor Abraham Oppenheim, was sent to Berlin in order to prevent the passage of several impending anti-Jewish laws. With the emancipation of the Jews in Germany the community increased, and in 1854 Dr. Israel Schwarz was nominated rabbi. In 1861 a beautiful synagogue, erected in the Glockengasse at the expense of Abraham von Oppenheim, was consecrated. 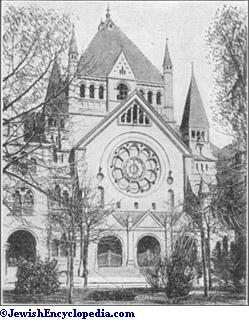 In 1876 the seminary for teachers, which had been founded at Düsseldorf in 1867, was transferred to Cologne and placed under the direction of Dr. Plato, rabbi of the Orthodox congregation 'Adat Yeshurun. A new synagogue was dedicated in 1899, in the presence of many representatives of both the state and the municipality. The liberal congregation has two rabbis, Dr. S. Frank, who, in 1876, succeeded Rabbi Israel Schwarz, and the recently nominated Dr. Ludwig Rosenthal. At present (1902) the community numbers about 10,000 Jews. They are engaged in all branches of commerce and industry, and many of them follow the liberal professions. The community maintains numerous benevolent societies, of which the most important are: an asylum for sick and old; Die Philanthropie, an institution for the promotion of arts and handicrafts; Quelle des Heiles, for the relief of needy tradesmen; Gemilut Ḥasadim, for lending without interest; Semikut Dallim, founded in 1849; Kotnot Or, for furnishing clothing to children of the poor; Armenverein, for the relief of the poor; Frauenverein, founded in 1820; and Waisenstiftung, founded in 1878. Among the recently erected institutions are: B'nai B'rith Rheinlandloge; an institute for training Jewish female nurses; a society for the study of Jewish history and literature; a children's settlement; and Das Jüdische Lehrlingsheim, a home for Jewish apprentices. The Central-Komitee der Zionist-Vereinigung für Deutschland has its seat in Cologne. In the Middle Ages, Cologne was a center of Jewish learning, and the "wise of Cologne" are frequently mentioned in rabbinical literature. A characteristic of the Talmudical authorities of that city was their liberality. Many a liturgical poem which still has a place in the Ashkenazic ritual was composed by poets of Cologne. The names of many rabbis and scholars have been preserved: the legendary Amram, traditional founder of the Talmudic school in the tenth century; R. Jacob ben Yaḳḳar, disciple of Gerson Meor ha-Golah (1050); the liturgist Eliakim ben Joseph; Eliezer ben Nathan (1070-1152), the chronicler of the First Crusade; the poet Eliezer ben Simson, who, together with the last named, took part in the famous assembly of French and German rabbis about the middle of the twelfth century; the Tosafist Samuel ben Natronai and his son Mordecai; the liturgist Joel ben Isaac ha-Levi (d. 1200); Uri ben Eliakim (middle of the twelfth century); R. Eliakim ben Judah; Ephraim ben Jacob of Bonn (b. 1132), the chronicler of the Second Crusade. The last lost at Cologne, in 1171, his son Eliakim, a promising youth, who was murdered in the street. His tombstone is still to be seen in the cemetery of Cologne. Among the rabbis and scholars of the thirteenth century were: Eliezer ben Joel ha-Levi; Uri ben Joel ha-Levi; Jehiel ben Uri, father of R. Asher; Isaac ben Simson (martyred in 1266); Isaac ben Abraham, brother of the Tosafist Simson ben Abraham of Sens (martyred in 1266 at Sinzig); R. Isaiah ben Nehemiah (also martyred in 1266 at Sinzig); the liturgist Eliezer ben Ḥayyim; Ḥayyim ben Jehiel (d. 1314) and Asher ben Jehiel (b. c. 1250; d. 1327); Yaḳḳar ben Samuel ha-Levi; Reuben ben Hezekiah of Boppard; Abraham ben Samuel; Judah ben Meïr; Samuel ben Joseph; Ḥayyim ben Shaltiel; Nathan ben Joel ha-Levi; Jacob Azriel ben Asher ha-Levi; Meïr ben Moses; Eliezer ben Judah ha-Kohen, most of whom are known as commentators on the Bible. The rabbis and scholars of the fourteenth century include: Samuel ben Menahem, Talmudist and liturgist; Jedidiah ben Israel, disciple of Meïr of Rothenburg; and Mordecai ben Samuel. These three are called in the municipal sources "Gottschalk," "Moyter," and "Süsskind." The rabbi who officiated at the time of the banishment was Jekuthiel ben Moses Möln ha-Levi (Pruno Süsskind). Brisch, Gesch. der Juden in Köln und Umgebung, Mülheim-a.-R., 1879.